QUALCOMM STADIUM (11/09/2015) The struggle continues for the San Diego Chargers (2-7) as they head into their bye week on a five-game losing streak. 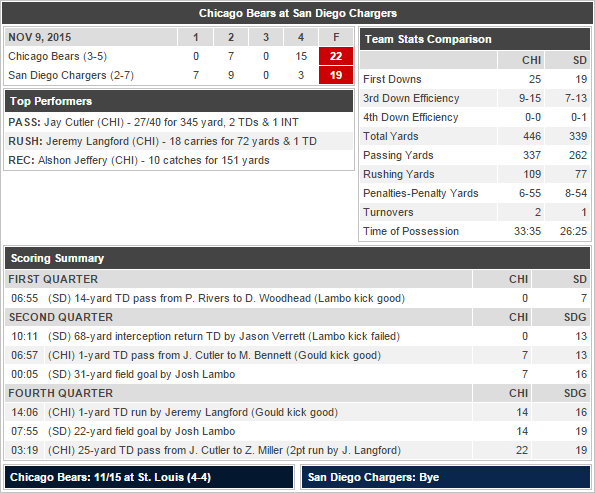 The Chargers held a nine-point lead after a quiet third quarter, but was outscored 15-3 in the fourth as the Chicago Bears (3-5) escaped with a 22-19 win on Monday Night. The dagger came when Jay Cutler found Zach Miller, who hauled in a one-handed catch for the 25-yard game-clinching touchdown with 3:19 left to play. Phillip Rivers' attempt at a potential game-saving drive came up short after taking two sacks from Lamar Houston and throwing an incomplete pass on fourth-and-long. The Chargers' offense got off to a great start, ending their opening drive with a 14-yard touchdown pass from Rivers to Woodhead. Jason Verrett gave the Bolts a 13-0 lead after a 68-yard pick six in the second quarter, but the second-year cornerback left the game with a groin injury a play later. Other notable injuries were WR Malcom Floyd (shoulder) and CB Patrick Robinson (neck).